The Motorola Minitor VI pager is an essential part of many public safety institutions. Trusted by fire departments and EMS personnel nationwide, these pagers have proven rugged reliability. The Minitor VI is Narrowband capable, available in the VHF and UHF bands, and supports 15 alert tones per channel. Five channel option is available. Each pager has a selection knob with eight modes, which we will program to your liking, free with each order of pagers. The Minitor VI comes with 16 minutes of stored voice capability. Give our sales manager Candice a call at 828.251.1243 for information about pager pricing, programming, and accessories. ��� Asheville Communications, Inc. carries the full range of Whelen Mass Notification Products. Feel free to give us a call at 828.251.1243 if you have any questions regarding whelen products, or our installation services. Asheville Communications carries a small selection of Gerber products, usually things useful for public safety personnel. If you or your organization wants to order something which is not carried at our retail location, we would be happy to order it for you, although minimum quantities sometimes apply. 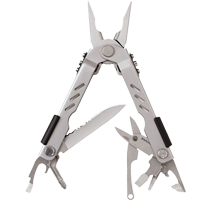 Click here to visit Gerber's website, where you can see multitools and knives we usually carry, and much much more.